We have developed a wide body of work which we have grouped into 6 related collections - outlined below. To view the whole range within each collection please click on the PRODUCT RANGE button on the left. 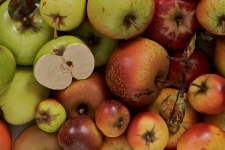 We currently create nine different varieties of apple and most are available as windfalls, that is, with all the detail of the regular sized apples but slightly smaller and more irregular shaped. As with all our work each piece is cast from nature and individually considered with appropriate layers of glaze applied to achieve the necessary finish. All glazes are devised by us in the studio. Each apple in the standard range is finished with a carved and stained wooden stalk. To complement these most are available with various metal twig and leaf arrangements, these too are cast from nature. When added to your chosen fruit they add a new dimension, which can enhance a group arrangement or stand alone as a more sculptural piece. We currently create nine different varieties of pear and most are available, as with the apples, as windfalls, that is, with all the detail of the regular sized pears but slightly smaller and more irregular shaped. As with all our work each piece is cast from nature and individually considered with appropriate layers of glaze applied to achieve the necessary finish. To compliment the Apples & Pears Collections, we also produce a range of other Orchard fruits as well as some of the more exotic varieties. As with all our ranges, this is an ongoing project as we are constantly experimenting to create just the right colour and texture. Once we are happy with the results we add them to their appropriate Collection. The Lemons, Plums and Apricots are also available with the metal twigs and leaves . 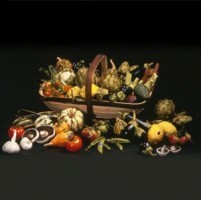 The arrangement opposite displays many of the vegetables within the current range of over thirty different types. The range includes large artichoke heads through three different sizes of aubergine to five different colours of peppers and chillies along with peas, beans, garlic and more. (many of which are grown on our allotment. Our horsechestnut range evokes a real feeling of nostalgia from all our collectors. It reminds them of their childhood, of country walks in the autumn and of course, the gathering of horsechestnuts along the way. We have aimed to capture the moment when the shell first bursts open to reveal the bright shiny conker inside. There are ten different types to collect, from a loose nut to a metal branch with three shells attached. Some come apart to reveal a bright shiny conker which can be removed from the shell itself and there are also larger shells with double nuts inside. All the twigs in the range are made in metal and hand painted. To compliment our ceramic horse chestnuts we have a range of metal acorns, created by sculptor Alan Ballantyne. These too capture a moment in time when the leaves are turning and the winter is drawing near. 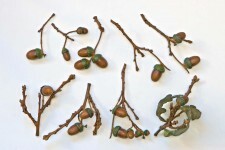 There are six different types to collect from a delicate single twig with one small acorn to a larger branch with five Acorns. These are also cast from nature but this time in metal which is then hand painted to look just like the real thing. 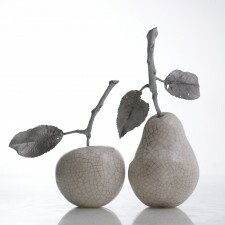 Alan also creates the metal twigs and leaves, which you will find in our range of ceramic apples and pears. This range comprises individual Sculptures of Fruits which purely emphasis their forms rather than their colour and texture. We chose a matt black or white glaze finish as well as a crackle glaze. These pieces would be an ideal present for a Wedding or Anniversary and can also be used to enhance the more minimal and stylized interior. This range is also available with metal twigs and leaves with a complimentary colour finish. As all our work has a glazed finish, they can be washed, will not be changed by either heat or light and therefore are perfect for displaying in the kitchen or conservatory, along with other situations within the home.